Cut pineapple brats in one inch pieces, enough to put 4 pieces on each kabob, cut peppers in wedges, cut onion in wedges, leave mushrooms whole. put all ingredients in swallow pan and pour Lawrey sesame ginger sauce over them. 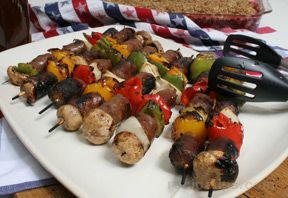 Arrange items on skewers, place heavy duty alumimin foil on medium hot grill. Baste kebabs with additional sauce as they cook. NOTE: If you can't find pineapple brats, just add pineapple wedges to the kebabs.